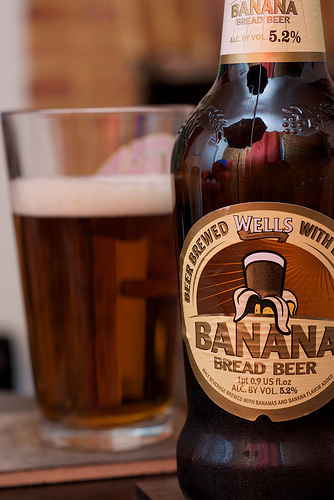 With floods a plenty in the sunshine state you might be missing your bananas, well I have found a solution for all you potassium*deprived beer drinkers, Wells Banana Bread Beer! Made by British brewing company Wells & Young, famous for Young’s Double Chocolate Stout. This delicate creation is made by the Wells side of the family. It sits nicely with 5.2 % alcohol by volume which in the 500ml bottle corresponds to 2.1 standard Australian drinks. In Australia it is only available in bottles but I have heard if you are running through the U.K. you can get it on tap. When you pour it out you see a lovely caramel brown colour flow out, I poured mine slowly and got a very small head but with some more aggressive pouring this probably won’t be a problem if you like a big head. Looking for a scent of an excellent dessert I lifted the pint glass to my nose, without getting my nose into it liker I have been known to do. Lo and behold I got exactly what I hoped for banana esters, brown sugar, vanilla and a little toast taste. I was stunned a little! But not enough to forget that the proof is in the eating.. or drinking as the case may be. It was smooth and the fair trade bananas that are used in the brewing really come through. This made the beer reasonably sweet and really cut out any real bitterness. If you think that I.P.A.’s with huge amounts of hops and I.B.U.’s that look like the Don’s batting average this beer probably isn’t for you. This is a perfect summer beer but it is best left out of the fridge for about 10 minutes before cracking it open. Being British it subscribes to the idea that beer should be drunk cool rather then cold. You get to enjoy the full range of flavors if you are ready to wait until it gets to about 8 – 10 degrees. So go relax on your porch and dream of summer with the help of Charles Wells and his free trade bananas.